Pours a nice looking dark reddish amber with an off white creamy head. The head is slowly diminishing but appears that it will stick around for a while longer and leave some nice lacing. Nice aroma of hops and some malts but mostly a hoppy nose. Not as much as an American IPA but nonetheless still a predominantly hoppy. It also seems to be more of a flowering hop verses the more pungent IPA hops, that may also be some of the malt sweetness that I’m smelling. This is hopper than I remember it being the last time I had it. Not complaining this is still a very refreshing beer. Very crisp and bitty but not overpowering bitter like some American IPAs can be. There are some sweet malt flavors that come through. I’m getting a nicely carbonated tingle over the tongue and a crisp hoppy finish. Just like on the nose the hops are more balanced in this beer at least more so than most IPAs. The ESB Extra Special Bitter qualities in this beer are superb. You get that hop sharpness but a sweetness of the malts also come through. The head has diminished to just a nice film on the top of the beer and a ring around the top of the class still leaving excellent lacing. Like I mentioned earlier this beer seems hoppier then I remember it in the past. That may be because I have been drinking maltier beers lately and that may make the hops seem more pronounced in this one. I was driving to the beer store after work today and was just craving an ESB. 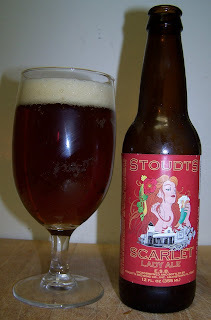 And Stoudts Scarlet Lady fit my craving nicely. ESBs are a unique style of beer. To me they have just the right amount of hops and malt balance or a crisp refreshing beer. Since this is an Ale so you get a little more character from it then you would a Pilsner or other refreshing Lagers. The more I drink this beer the more accustomed I’m getting to the hop bitterness and I'm really start to enjoy the other flavors that are coming out now that the beer is opening up and warming up a little. There is definitely a nice malty sweetness that is just starting to come though. Down to the bottom of the glass, there is just a cluster or island left of the head but still a nice ring around the sides and still leaving some lacing. Now at 64 degrees this beer just keeps getting better and better as I drink it. It seems like I just started enjoying the caramel malt flavors as I finished the beer. That was just too good to say goodbye to so I think I’m going to have another one while I work on my final comments. So how can I describe this ESB to you? It’s definitely a hoppy ale but it does not have an overpowering lingering bitterness in the aftertaste or as us beer snobs would say the “finish”. There is a malt and sweet ale character to this beer similar to a red or amber ale. The hops give a very distinct bittering characteristic to the beer but not overpowering. Overall it’s a very refreshing beer. It’s definitely a beer that you want to have more then one of. Wow the old Schaefer jingle just popped into my head, you know “Schaefer, is the, one beer to have, when you’re having more then one”. I hope it doesn’t stay there to long. I like and appreciate well crafted beers but I’m not a “Hop Head”. An ESB has just the right amount of hops to enhance the flavor but not overpower the beer. This is a fine delicate balance that makes an ESB one of the most difficult brews to make. Plus this fine line varies to each person’s individual taste. I think I’ll have to put up another post on my take on hops. To me there is a limit to how much you can or should hop up a beer. Overall for an ESB, Stoudt’s Scarlet Lady is on the top of my list, this is probably my favorite ESB, a solid A or A+. If you like a beer that has a bite but not a lingering bitterness try this ESB. Still on the hoppy side but not as bitter as a typical American IPA.